Hey y’all – aloha! 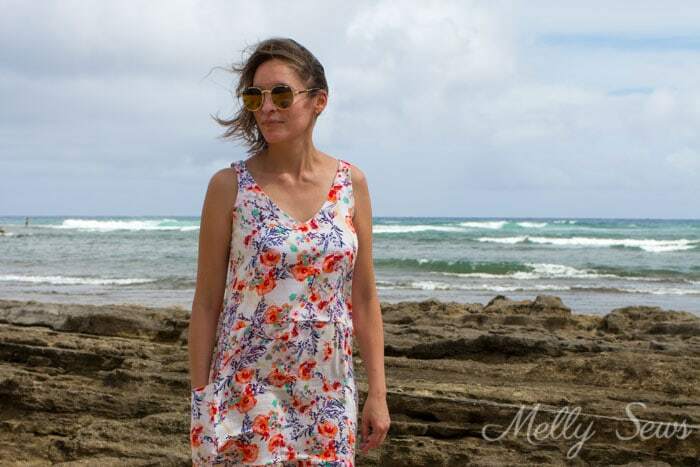 Today I’m sharing this floral sundress that was my last minute travel sewing for this vacation. Once upon a time, before we had kids, the Coach and I took a trip to Hawaii and fell in love with the state. And we returned every summer…but then we had the boys. We did manage our first trip back as parents 5 years ago…and since then we’ve stuck a little closer to home with out travels with the boys. But this summer we got to go back, and I wasn’t going to let the opportunity go to waste to shoot some sundresses! This one is made from a rayon challis that I got from my friend Susan’s stash, and have been hoarding for the perfect project. I knew I wanted a sundress that I could wear a regular bra with, and that it needed to have pockets, so this is what I came up with. Between the floral print and the wind, I know it’s a little hard to see the style lines of this dress, so I added a little line drawing to help. 2 ish yards of 60 inch wide fabric – you may need more or less if you decide to make the skirt a different length or fullness. I think I used 1 1/2 yards for the one I’m wearing. 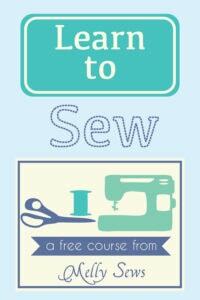 To download the pattern for free, subscribe to the Melly Sews Weekly Newsletter. AFTER you sign up, you’ll get a confirmation email – and you have to confirm or my email service can’t send you the free pattern access email. But once you do confirm, you’ll get another email with instructions to access to not just this but all my free patterns. Woot! Note – if you already subscribe to the newsletter, just find your most recent one and follow the link and password instructions at the bottom of the newsletter. Resubscribing is not necessary and doesn’t re-send you anything. OK, so to start you need to sew the bodice using the burrito bodice method – just like I outlined in this post. Now it’s time to do the skirt. 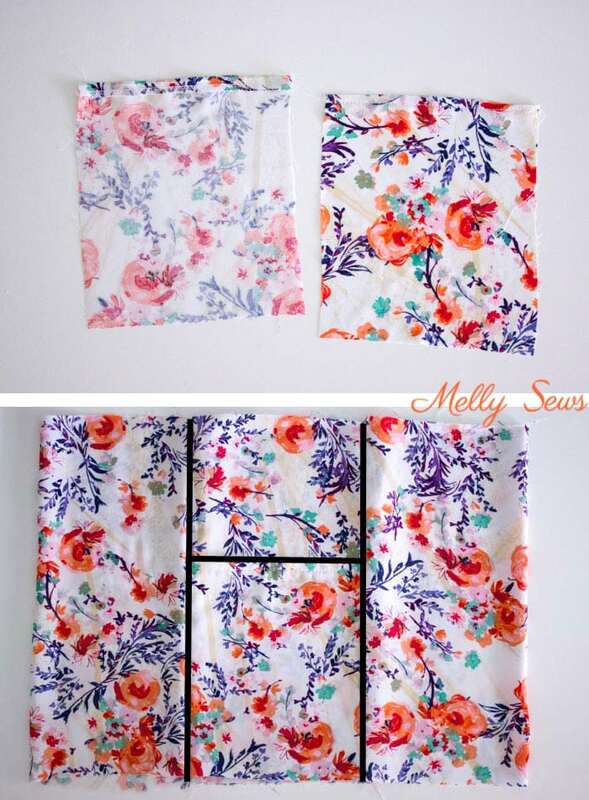 First, sew a small hem on the top of each pocket piece as shown below. Next you’re going to assemble the skirt. First place the pocket piece wrong side to one of the side skirts’ right side, matching the bottom edges. Then place either the skirt front or back right sides together with those pieces and sew a side seam that catches the pocket as well. 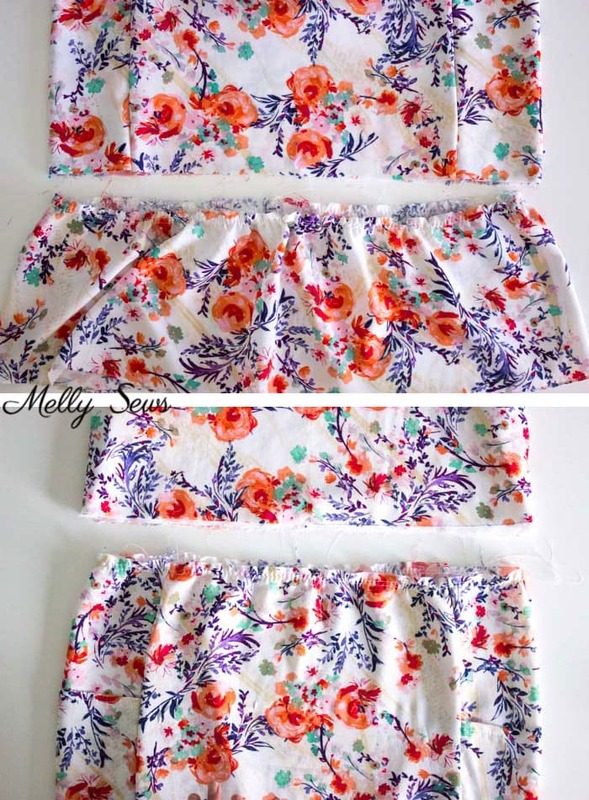 Repeat on the other side with the skirt front or back (whichever you didn’t already use) and your skirt should look like the picture above – with a panel that ends in a pocket centered between two larger pieces. Sew in the pocket/side skirt combo for the other side the same way, so that now your skirt is a loop. Make sure you finish your seams. Next, sew your ruffle piece into a loop. Then sew a small hem (I did a rolled hem) along the bottom edge and sew basting stitches along the top edge to gather the ruffle. Gather the ruffle to the same width as your skirt, then pin the ruffle and skirt right sides together and stitch. 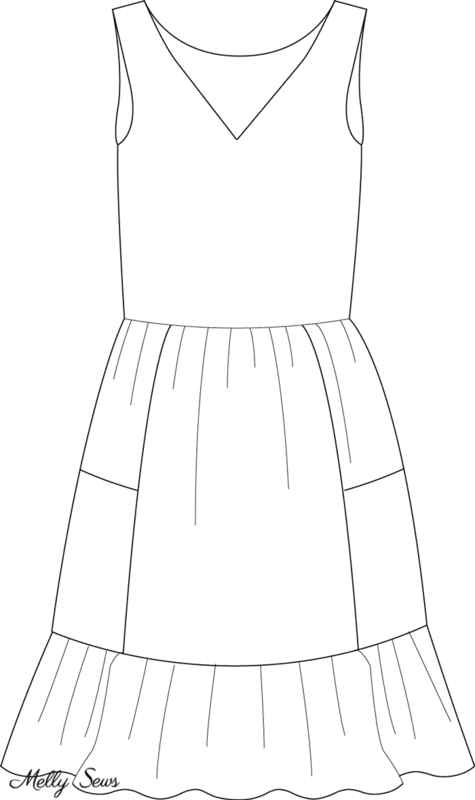 Make sure that you are matching the ruffle to the bottom (pocket) edge of the skirt and centering the ruffle seam at the skirt center back. Finish the seam. Repeat the process of basting and gathering the top edge of the skirt to the width of the bodice. Mark the center front and center back of the skirt, then stitch the skirt to the bodice. I was in a hurry, so I pinned the skirt to both the bodice and lining and finished with my serger. But a nicer way to do it (that wouldn’t require a serger) would be the same way I finished this dress. And then take your dress on vacation! Love. Love. LOVE!!!!! Okay, pockets?! LOVE. Wear with a regular bra…. I’m over the moon in love!!!!!! This is gorgeous and it looks perfect!! You look lovely and relaxed!! 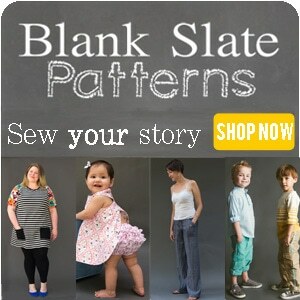 Thank you so much for ALL your patterns!! You are a genius along with having a giving spirit.. 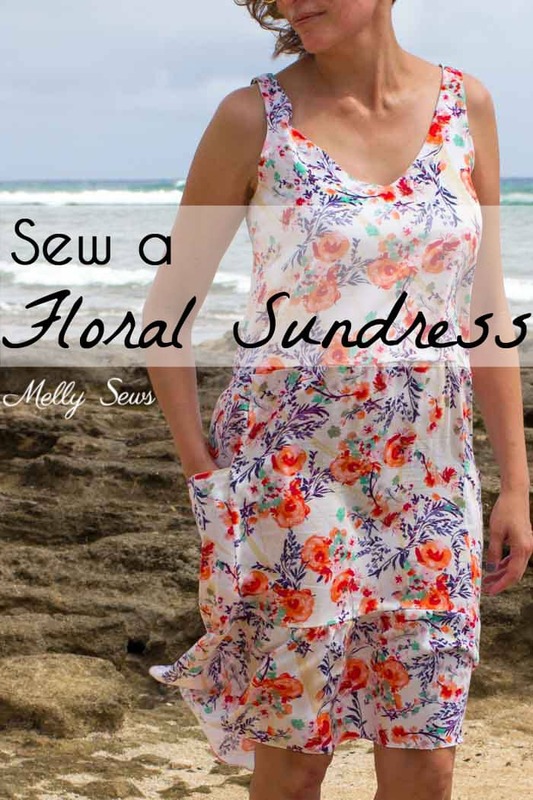 I cannot thank you enough for the free sundress pattern. I had my first mastectomy in 2010, the second in 2015. I haven’t been able to wear all those cute sundresses with thin straps since due to wearing a mastectomy bra. Thank you, thank you, thank you for allowing me to look cool in the summer and feeling free once again. You don’t realize how restraining breast cancer is until you have your breasts removed. Of course I am thrilled to be alive but to feel free while living is an added bonus. I am cutting as I am writing. I am requesting that your guardian angel provide you with a special cloud in Heaven.